My Dad and my stepmother, Kim, keep a kosher home. My husband and I are not as great about keeping kosher, but we do try in certain regards (which is why I never prepare pork-based products, and use Empire chicken; I'm not so great with sea-life, however). When we first moved to Brooklyn, they gave us a kosher cookbook as part of our housewarming gift, called Kosher By Design, Short On Time. This book actually has some pretty tasty kosher recipes, all of which are easy to make, including a recipe for blueberry salad. 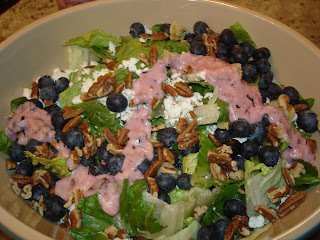 My blueberry salad is very different from the one in that book, but it does contain blueberries and a blueberry colored dressing that is just the pretties shade of purplish-blue. Also, it looks creamy, but there is no cream at all in the dressing and its actually pretty healthy (not to mention all those antioxidants in the blueberries). I should probably mention that it is a blustery and cold five degrees outside. Blueberries are not in season and will not be in season for some time, but I had a blueberry craving, probably because I wish it was warm again. Thus, although the blueberries I found at the grocery store are actually pretty high quality, they were a bit on the expensive side. However, this does make wonderful and fresh summer salad, especially with a glass of Chardonnay. If you prefer strawberries, I encourage you to check out Eric In Jersey City's Strawberry Salad, and if you like citrus fruit, check out my Mandarin Orange Salad With Caramelized Almonds.